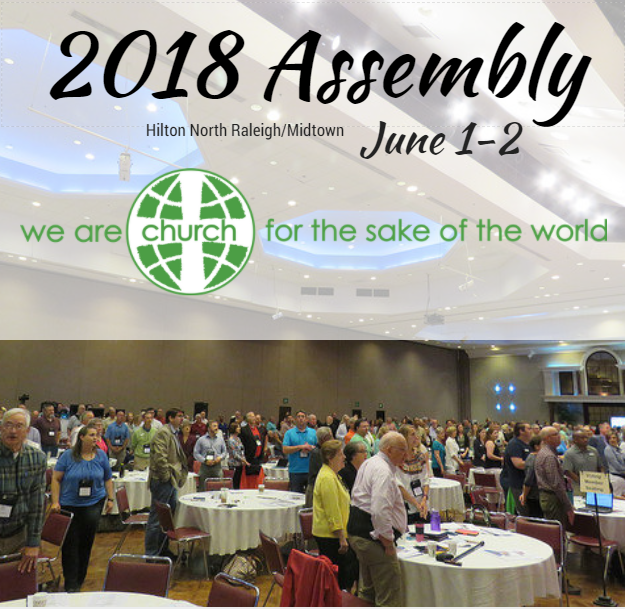 There are numerous reasons one might attend a synod assembly like our upcoming one June 1-2 in Raleigh. Maybe it’s duty, as in, at a congregation council meeting, “Okay, people, somebody has to go. Our constitution requires it.” Some go because they want to catch up on what’s happening in the larger expression of the Lutheran Church in NC. Some go to catch up with old friends, classmates, etc. Some go to worship with a lot of people. Some go to vote in order to make their voices heard in the business of the church. Some go to present, hear, or debate proposed resolutions or memorials. Or all of the above and more. I do hope your congregation has registered folks by now. If not, you can still register until May 15 at this link. There are also three pre-assembly events, one on “Growing Young” which addresses the most oft-heard question I get when I visit congregations; namely, “How do we get/energize/keep young people in the church?” It’s all day on Thursday, May 31. The other two are only in the afternoon on May 31—one on Gun Violence in America in the wake of so many senseless shootings and one on Narrative Budgets, Compensation, and Mutual Ministry. Unlike last year, we have a few resolutions/memorials that have been submitted prior to the deadline. These always provide lively discussion and help us struggle with current issues facing the church and the world. We’ll worship together. We’ll vote on budgets, voting members from our synod to the Churchwide Triennial Assembly 2019 (Milwaukee), agency and institution board member ratifications, Synod Council members, and perhaps more. We’ll hear all sorts of reports. Our worship and music will be supported by the ELCA’s very capable Glocal Musicians (for those who attended Bold Like Jesus this year, these are the same ones). We’ll remember and memorialize rostered ministers who have died since last year’s assembly, we’ll honor rostered ministers with significant anniversaries in ministry, and we’ll hear our churchwide representative from the ELCA share with us the broad ministry of our ELCA. We’ll sing, pray, peruse display tables, engage in table discussions, eat, share fellowship, and renew and build relationships that strengthen our identity as church together. I’ll unveil the new Vision for the NC Synod approved by our Synod Council this past March, and we’ll hear proposals for realignment of our structure and governance, including potential constitutional changes. Okay, so it’s not vacation, but it is the business of the church, to which we currently tend once a year with all 197 congregations of the NC Synod. It’s important; in fact, if we’re going to be a synod at all, it’s essential that we regularly gather AS the synod. I hope you and/or someone from your congregation will plan to be there.